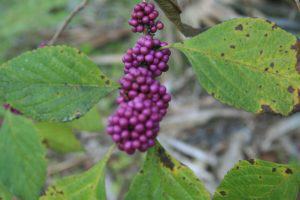 Beautyberry, or Callicarpa Americana, is native to Florida. It is drought-resistant and easy to grow. 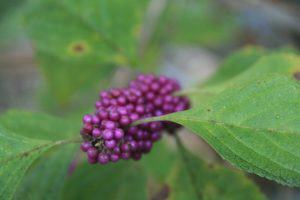 In the fall and the spring it has gorgeous purple berries clustered around the stem. Everyone should have at least one of these in their yard. The leaves have mosquito repellent properties. You can crush a few leaves and rub them on your skin to keep the bugs at bay, or you could make the decoction that Green Deane describes in his EAT THE WEEDS BLOG. The berries make good jam or syrup – the blog has the recipe.